As with so many of the best open world games, the real star of Dishonored is its setting: Dunwall city. The game’s tale of urban blight, thievery, and betrayal plays out in a darkly-mirrored London that provides safer refuge to rats than the poor people who carry the city on their shoulders. There’s little in the way of hope for them, but then again, the blackness of its heart is what I love about Arkane’s 2012 stealth-action game. 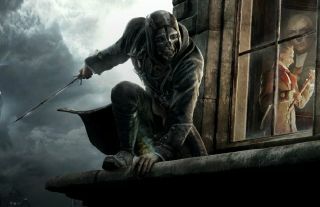 Chaos in Dishonored’s world—and its resolution through the player’s actions as assassin Corvo Attano—is what makes the game such a brilliantly rendered slice of alternate reality. Science and the supernatural mingle and mate in a soot-stained alley to produce one of the most memorable game worlds of the last 10 years. I get to smile and eat jellied eels, but every trip to Dunwall also has me thinking about the piles of coal and bloody refuse that produced so many of our modern glass and steel cities. Every metropolis has a history only its rats can tell—some are just more honest about it. Dishonored faces this truth head-on. Scott Lynch’s debut novel features thievery, deception, and questionable characters, all set against the wonderfully weird backdrop of Camorr—an island city with many districts and many problems. Lynch’s Camorr excels at giving you a vivid, bottom-up perspective as it unwinds the story of orphan-turned-con-artist Locke Lamora. The first part of Lynch’s Gentlemen Bastards series, you can get a free taste of the novel by downloading the prologue from Lynch’s homepage. As we can see from Mitton’s comments in the link above, Kolesov’s work was obviously influential in shaping Dishonored’s distinctive style and he has since joined Arkane Studios as a concept artist. I can only hope he’s hard at work on a Dishonored 2, or something like it. Above I’ve included a video of him speed painting a strange machine that looks like it could be right at home in one of Dunwall’s back alleys. An online gallery of Kolesov’s prints is available here, and you can also check out his official blog. When we see Bruce Wayne deep in conversation with Sigmund Freud at the outset of this graphic novel, we realise immediately this is going to be an unusual take on Batman. The alternate setting presents Batman in the year 1889. Wayne is still the troubled rich loner we’ve come to know, but the world around him speaks more to the fears of the 19th century than to the high-tech interpretations of the Dark Knight experienced in the recent Christopher Nolan films. It’s a time when a madman with a sharp knife can put an entire city on edge. There’s no question that this comic builds on some classic ways of playing with the Batman-as-dark-guardian story we’ve read before, but Gotham by Gaslight’s nod to Victorian-era architecture—and the specific kind of horror those cities created for their citizens—makes this a good fit for fans of Dishonored’s grimy Dunwall. Alex Proyas’ 1998 film Dark City borrows a lot from familiar urban noir storytelling, but its style and story both have their own deceptions to uncover, which I won’t spoil here. It’s enough to say that it begins with amnesia, a deadly crime, and a man on the run. As in Dishonored, life in Dark City centers on its residents’ uncertainty about where they stand—literally, given the city’s let’s say unreliable topography—why they’re doing what they’re doing, and what it all really means. In a place of apparent monolithic size and dimension, nothing stops moving. Navigating this anxiety are a cast of characters anchored by Rufus Sewell, Kiefer Sutherland, Jennifer Connelly, and William Hurt, and they all turn in suitably uncanny performances. Dark City was also one of the late Roger Ebert’s best-reviewed movies, and for that reason I link his writing here. There may be spoilers, but Ebert’s take is worth it. Although both films are much more well-known than Dark City, you might also check out Terry Gilliam’s Brazil or Christopher Nolan’s The Prestige. The two movies give more than a few tips of their hat to many of the themes surfacing in Dishonored’s fallen city. For more installments of ‘If you like...’, check out Patrick’s recommendations for Mass Effect, Skyrim, Fallout 3, and Deus Ex fans.